Mail Says Our Nice Weather Is Due To Global Warming! The Mail really is getting awful these days! If winter seemed unseasonably warm this year, it’s not just a coincidence, according to the National Oceanic and Atmospheric Association (NOAA). 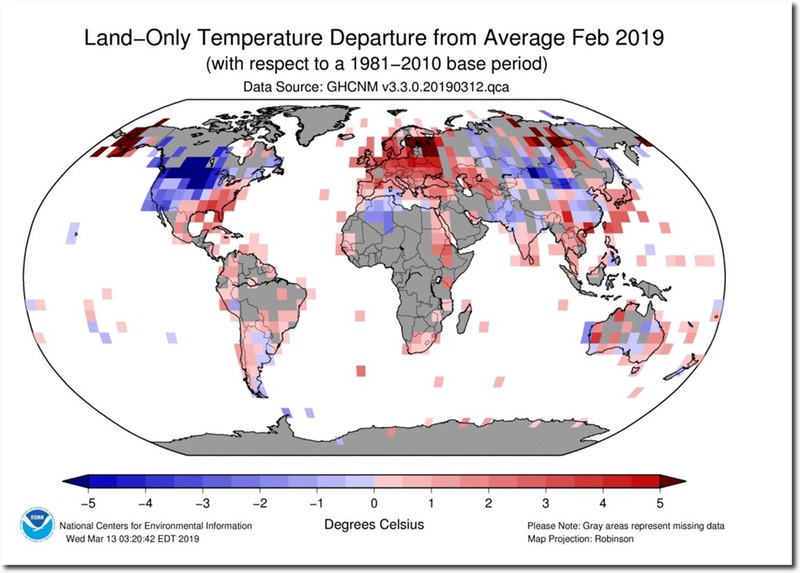 In 2019, January through February was the globe’s fourth warmest two-month period in 140 years said the organization in a recent monthly report. 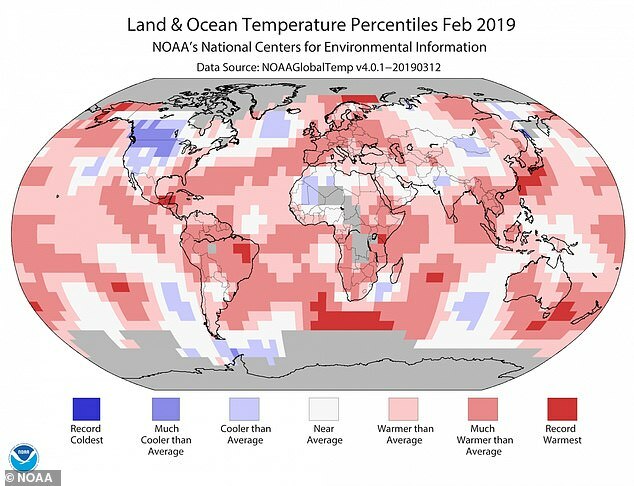 According to the NOAA, which chronicles rising temperatures across the globe, the month of February clocked in at 55.3 F, which is 1.42 degrees higher than the 20th century average of 53.9 degrees. 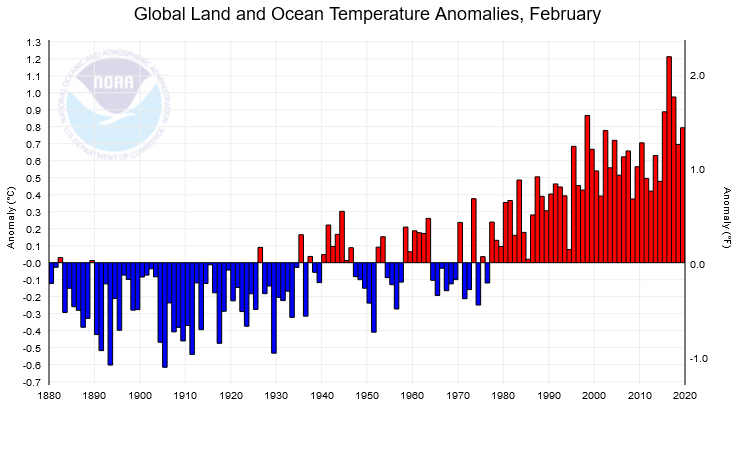 The idea that our warm weather in February had anything to do with global warming is utterly ridiculous and dishonest. It had no more to do with global temperatures than the record cold in the US did, or for matter the Beast from the East that froze us last year. Even if we accept NOAA’s figures ( a big IF), global temperatures last month was pretty average by standards of the last couple of decades, which like it or not is now our “normal climate”, ie the one we are used to. ← Water Shortage? Blame Climate Change! i don,t know how many noticed, but in last Sunday’s Countryfile, a farmer reported weather difficulties last year, not because of the warm summer, but the fact that it followed, in his words “A 7 month winter”. Weather has always “equalled out”, for example, the recent hot early February daytime temps averaged by very cold nights. What amazes me is that the BBC failed to edit the comment out! Journalists show their stupidity and bias on a regular basis and then wonder why people don’t like them, don’t believe and cross the street to avoid them. Don’t want people to despise you? Don’t be stupid, don’t lie and don’t present only biased reporting. Otherwise, get used to be ignored, actively avoided and considered the enemy of the people. Newspeople are lower than used car salesmen and street vermin. But are on a par with our MPs, inhabiting the same sewer of ignorance. I don’t think it is just me but the vast majority of the scary red record warmest bits on the NOAA map are at sea where temperature monitoring is sparse to say the least. And why would we trust NOAA anyway given they, along with the BOM and our MetO, are determined to make up the evidence to underpin the UNFCCC. Two month stretch? What exactly is that? Presumably January wasn’t up there, nor February, but put them together and viola, a record. And yes, the last four years or so have been a bit warmer than the years before that. And? Paul, I blame NOAA more than I do the Mail. I know the Mail are happy to print every Climate scare story going, but in this case it was supplied by NOAA who have an agenda to push. According to NOAA… February 2016 and 2017 were higher… 55.96*F, 55.54*F, respectively. The NOAA needs constant funding (like most Federal Agencies) and the income stream has possibly become infrequent with The Donald recognising that scary Climate Change has become the stimulus. So sad that the Daily Mail has become a standard ‘progressive’ newspaper after Paul Dacre left. We have to expect more of the same. Why are we worrying about what newspapers say? Hardly anyone reads them nowadays, the online versions are only read by people who want to point out how full of crap they are. Meanwhile people are saying “Warmer weather, yes please”. In the graphic – Land-Only – I’m assuming the stations out in the oceans, are islands (land)? Was that the adjusted or unadjusted set? They would be more honest if they said “Since 1910”. There are some extremely high temperatures pre-1910 – which NOAA and BOM then choose to ignore on the grounds that measuring equipment and siting had not been standardised back then. I am assuming that they have come up with the “two month period” because neither month taken on their own was in any way exceptional. I don’t recall having seen a 2-month metric being used before. 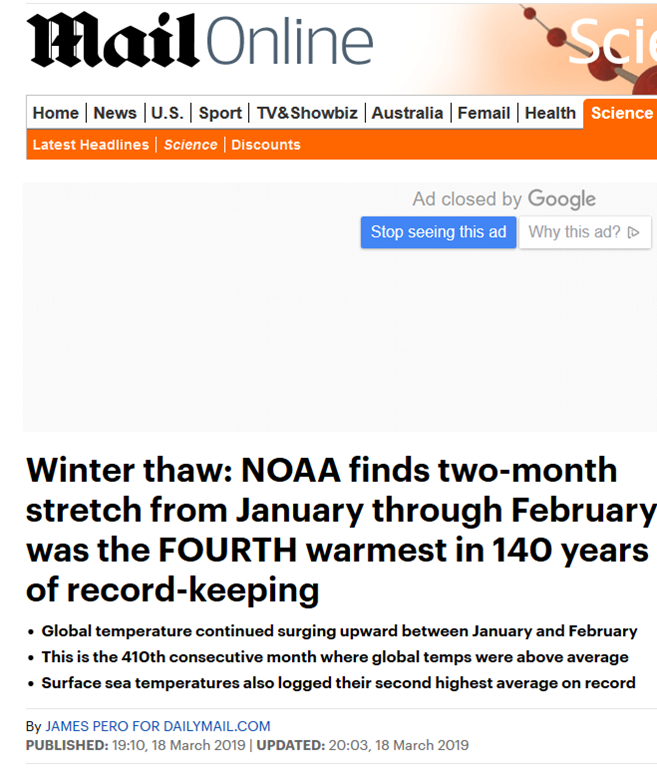 interestingly looking at the comments in the Mail over this article, hardly anybody believes what the NOAA are saying as they know they are fiddling the figures. What is surprising is that Trump has not sorted out this crooked organisation and fired Schmitt and his crew. Annual sunshine hours in England had increased 37% in 2018 compared to 1968. Hmm I wonder if that caused any higher temperatures.